DiverCity: Waarom wonen arm en rijk steeds verder uit elkaar? Waarom wonen arm en rijk steeds verder uit elkaar? Sociale mix in Europese hoofdsteden is laatste tien jaar verdampt door toenemende inkomensongelijkheid. Sociale vermenging is een politiek stokpaardje, maar in de hoofdsteden van Europa gaan arm en rijk steeds verder uit elkaar wonen door toenemendeinkomensongelijkheid. Wat valt er tegen te doen? En is dat nodig? Als je (groot)steden op hun beloop laat, zijn ze binnen een jaar of tien'uitgesorteerd' met echt afgebakende rijke en arme wijken. Want van zodra ze de kans krijgen, verhuizen mensen naar wijken waar de bewoners meer passen bijhun eigen sociaal-economische positie. Dat schrijven Nederlandse onderzoekersin het nieuwe rapport Socio-Economic Segregation in European Capital Cities. EROSION DE LA MIXITÉ SOCIALE : SOCIAL MIXING IS DECLINING IN MANY AREAS. “This spatial segregation of rich and poor can become a breeding ground for misunderstanding and social unrest. Residents who are able tend to leave predominantly low-income neighbourhoods. This accelerates the process of segregation, making cities more susceptible to social unrest and less attractive as areas for locating a business. extremes should be avoided. This can be accomplished by investing in neighbourhoods and communities, but especially by reducing inequality through investments in education and social mobility. Il est de bon ton de critiquer les tentatives de gentrification à Bruxelles. Elle permet cependant, lorsqu’elle et bien conduite, d’insuffler un supplément de mixité sociale dans des quartiers à forte densité immigrée. L’exemple du quartier Dansaert est très parlant, aussi celui de la zone du canal en pleine mutation. Reste à savoir si la mise en place du piétonnier aura le même effet. A Gand, la mayonnaise a pris au-delà de toute attente. A écouter samedi le bourgmestre Yvan Mayeur, on n’a pas eu vraiment l’impression que cet habile communicateur a une vraie vision de son projet de ville. Bien au contraire on a le sentiment qu’il réagit au coup par coup sans conception d’ensemble de la nécessaire modernisation de Bruxelles que cherche à promouvoir la Région. The widening gap between rich and poor is leading to segregation in more and more European cities. The rich and the poor are living at increasing distance from each other, and this can be disastrous for the social stability and competitive power of cities. 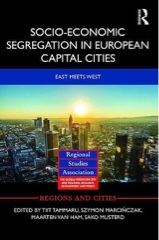 These conclusions are based on the comparative study entitled Socio-Economic Segregation in European Capital Cities. This study compares the situation in 2001 to that in 2011 for thirteen European cities. The study concludes that social mixing is declining in many areas. With some delay, socio-economic inequality is causing people in different income classes to live farther and farther away from each other. “This spatial segregation of rich and poor can become a breeding ground for misunderstanding and social unrest,” argues Maarten van Ham, Professor of Urban Renewal in the Faculty of Architecture and the Built Environment at TU Delft. “Recent riots in Paris, London and Stockholm cannot be considered separately from the concentrations of poverty in these cities. Our study demonstrates that this problem is growing.” Van Ham was one of the driving forces behind the study. Increasing inequality in response to globalisation, the restructuring of the economy and the labour market, neo-liberal politics and – in some cities – declining investments in the social rental housing sector are direct causes of the increasing segregation. This is the conclusion that the scientists have drawn from hard data on the cities included in the study. Teams in London, Amsterdam, Riga, Vilnius, Tallinn, Madrid, Milan, Athens, Budapest, Oslo, Stockholm, Prague and Vienna examined comparable information (e.g. on income and jobs) for each city. Drawing on the literature, they developed predictions concerning segregation in each of the thirteen cities and tested them in practice. They linked the assessment to an in-depth analysis of the unique local situation and policy in each city. The results indicate that the theory certainly does not always correspond to practice. For example, for quite some time, Stockholm has no longer had the equal distribution of social environments that previously characterised the ‘social paradise’ of Sweden. The liberal political climate of recent decades has put an end to that: Stockholm displayed the sharpest increase in segregation between rich and poor in the past ten years. Predictions for typical Western-European cities were accurate for the globalised cities of London (strongly segregated) and Amsterdam (moderately segregated), but not for Vienna. The strong mixing of rich and poor in the Austrian capital city was eliminated in the first decade of the 21st century. According to the researchers, this was largely due to the concentration of lower income groups in social housing complexes and the influx of immigrants. In Athens, the income differences are large as well, although there is no evidence of strong spatial segregation. The conclusion for this context is that the housing market in the Greek capital city, which is characterised by a high percentage of homeownership, has been ‘locked’ by the economic crisis. Amsterdam is the only one of the cities investigated in which the social mixing of population groups has shown a slight increase. “This is probably a temporary result of the crisis. Since the onset of the crisis few of the middle-class families in Amsterdam have moved out of inexpensive social housing units, thus maintaining the level of mixing,” explains Sako Musterd, Professor of Urban Geography at the University of Amsterdam. Although the study focuses on income segregation, ethnicity sometimes clearly plays a role. This is the case in Stockholm, as well as in Tallinn, the European leader in the area of socio-economic segregation. In this city, disadvantaged communities with high concentrations of low-income groups are populated largely by ethnic Russians. It is interesting to note the remarkably low levels of segregation in the other Baltic capital cities of Riga and Vilnius.